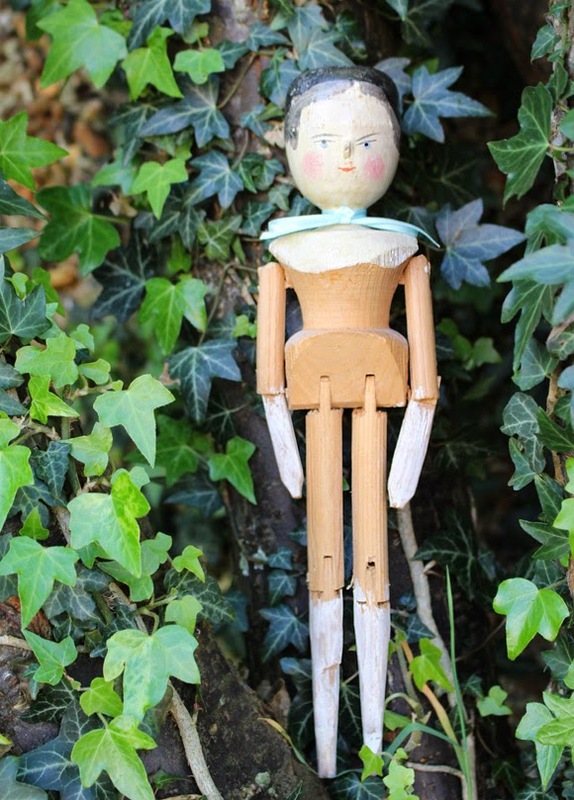 It occurred to me that I have never dedicated a post to one of my most prized possessions - Lily, my antique wooden peg doll and the muse of this blog. Well it's time to right that wrong and celebrate the wooden doll that holds a dear place in my heart! My obsession with wooden dolls - or Penny Woodens as they are sometimes known - stems back to my childhood when there used to be a rather gentle cartoon on TV called Pinny's House. For some reason Pinny and her adventures really captured my imagination and - though at the time I wasn't short of a Barbie or two - I always dreamed of owning something a bit more special - a wooden doll just like Pinny. As I grew up, I saw wooden dolls like this trapped behind glass in various museums and stately homes and the prospect of ever owning one seemed slimmer and slimmer - after-all, if they're in museums they must be incredibly expensive, right?! 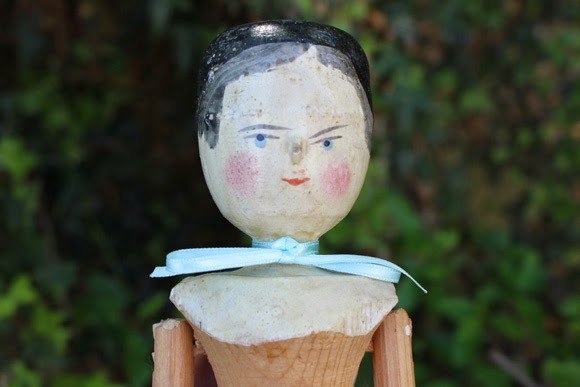 But as time and technology developed (we're talking a decade or so here), some wistful eBay browsing lead me to a few rare listings of antique wooden peg dolls! Some had broken, detached limbs; some were missing their noses; some had chunks of wood missing from their faces - and then there was Lily. The perfect example. Rose-bud cheeks, powder-blue eyes and those signature swoops of painted hair. Needless to say, I bid for her and won. She was actually listed with another doll and as the pair were quite pricey I split the bill with my Mum who also loves a good antique. Today, our shared collection includes Lily's sister named, funnily enough, Pinny along with Emily and Jessie who we've found since. But Lily is all mine. My very own beautiful peg doll. She stands keeping guard on my dressing table with a mint-green ribbon tied around her neck and I love her to pieces. If you scroll down you can view a short video I made of these peg dolls - it's nothing much, but I thought it might be nice for you to see the dolls with some movement. Pinny's House - Coming Soon! She's a beauty! They all are, in fact!